Myth: Is it true that only lewd women wore underwear before the 20th century? Then yes, women have been wearing underwear for thousands of years! Before industrialization and mass production, clothing was extremely expensive. Not only was fabric time consuming to produce, the making of the garments themselves was a time consuming process. People didn't have a million pieces of clothing like we do today. Colorfast dyes, ie dyes that won't wash away, are a relatively new invention, having only been around for a couple hundred years. So clothing was not washed very often to preserve the color, and also to save the textile from too much wear. Furthermore, clothes had to be protected from the grime of the human body. Something needed to be worn directly against the skin, which would absorb sweat and oils, and could be washed regularly. And, after shaped silhouettes came in style, women needed something to mold their outerwear into the correct, fashionable shape. Thus, underwear was very important. Undergarments were almost always white, and could be washed and changed regularly. Underwear changed through the ages. Ancient women tied bands of cloth around their breasts for support, a very very early form of the bra. The base garment for all women since the middle ages is the chemise or shift, a plainly cut white garment that fit close to the body. The historic equivalent of an undershirt. At various times, women have also had bloomer-like garments, which fit around each leg and connected around the waist. It's important to note though that these were always crotchless, to make going to the bathroom easier. 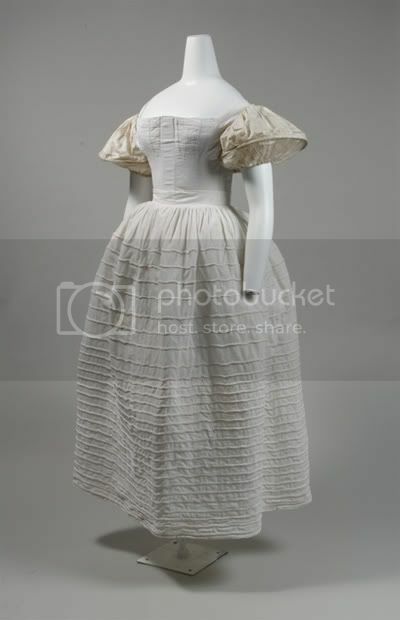 Once we get further into history, women started adding petticoats and shaping garments and padding in order to achieve the correct silhouette. In fact, the most important part of an historic garment is the underwear, as that is what gives the garment the correct shape.